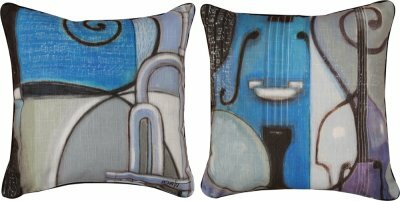 This reversible pillow, designed by Norman Wyatt Jr. from the Climaweave Collection features a Piano and trumpet. It will certainly delight jazz lovers, bass and trumpet players and will make any seating area pop. There is matching tapestry throw. It measures 18" square and is great for both indoor and outdoor decorating! Weather Proof- Resist Moisture and Fading Durable- Enjoy Season after Season.